Meet DRG at EuroMedLab in Athens! 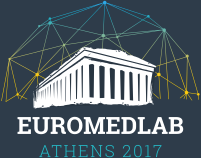 DRG will participate at EuroMedLab 2017 from June 12 - 14 in Athens (Greece). The 22nd IFCC-EFLM European Congress of Clinical Chemistry and Laboratory Medicine will be held in Athens at the Megaron Athens International Conference Centre (MAICC). We cordially invite our clients to join us at DRG´s booth #24 for meetings throughout the day!